Haka is the generic name for all Māori dance. Today, haka is defined as that part of the Māori dance repertoire where the men are to the fore with the women lending vocal support in the rear. Most haka seen today are haka taparahi (haka without weapons). For most non-Māori New Zealanders today their knowledge of Haka is perhaps limited to that most performed of Haka called "Ka mate, Ka mate". Many sports teams and individuals travelling from New Zealand overseas tend to have the haka "Ka mate" as part of their programme. The sports team that has given the haka the greatest exposure overseas has been the All Blacks, who perform it before their matches. It has become a distinctive feature of the New Zealand All Blacks. More than any aspect of Māori culture, this complex dance is an expression of the passion, vigour and identity of the race. Haka is not merely a past time of the Māori but was also a custom of high social importance in the welcoming and entertainment of visitors. 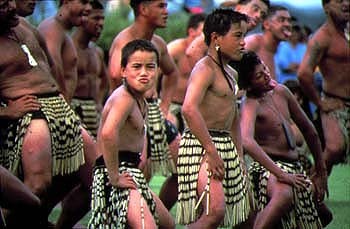 Tribal reputation rose and fell on their ability to perform the haka (Hamana Mahuika). According to Māori ethos, Tama-nui-to-ra, the Sun God, had two wives, Hine-raumati, the Summer maid, and Hine takurua, the Winter maid. The child born to him and Hine-raumati was Tane-rore, who is credited with the origin of the dance. Tane-rore is the trembling of the air as seen on the hot days of summer, and represented by the quivering of the hands in the dance.